If you're looking for super scenery, here it is. Kaua'i's central volcanic peak, Mt Wai'ale'ale, is allegedly the wettest place on earth, and the island is richly green and spectacular - so spectacular that parts of Raiders of the Lost Ark, South Pacific and Jurassic Park were filmed here. Kapaa, Kauai Our 3-Star classification designates those properties where guests experience an ideal mix of comfortable accommodations and modern amenities. Most of these hotels feature a variety of services, and offer distinguished style and comfort. This beachfront hotel offers the ultimate island-life experience with local charm and modern amenities. Poipu, Kauai Our 4.5-Star classification designates those properties with well-appointed, deluxe accommodations, extensive amenities and comprehensive guest services. Expect attention to detail and a warm and hospitable staff ready to cater to your needs. These superb properties offer a truly refined getaway. Half star indicates that the hotel/resort meets all criteria of the designated rating and exceeds in certain areas. 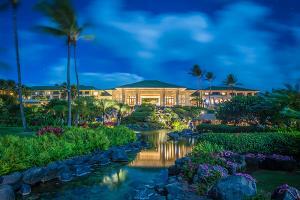 Just a short walk from legendary Poipu Beach, this resort offers gracious service, spacious and luxurious residential style accommodations and sweeping ocean views. Kauai, Lihue, HI Our 4.5-Star classification designates those properties with well-appointed, deluxe accommodations, extensive amenities and comprehensive guest services. Expect attention to detail and a warm and hospitable staff ready to cater to your needs. These superb properties offer a truly refined getaway. Half star indicates that the hotel/resort meets all criteria of the designated rating and exceeds in certain areas. 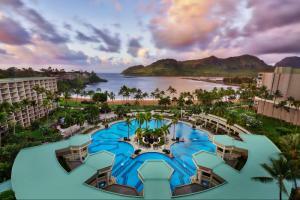 Majestic waterfalls, blue lagoons and lush tropical surroundings distinguish this deluxe Hawaiian resort set on beautiful Kalapaki Bay. 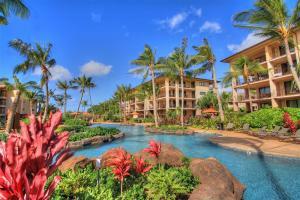 Poipu, Kauai Our 5-Star classification designates those select properties that provide exquisite service and amenities. The discriminating traveler will find the accommodations, ambiance, dining, and staff assistance of the highest caliber. These properties offer the utmost in luxury and will provide an outstanding experience. 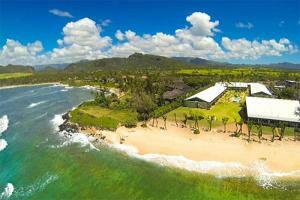 Experience graceful grandeur at this Hawaiian classic resort on the soothing white sands of Kaua’i’s sunny south shore.